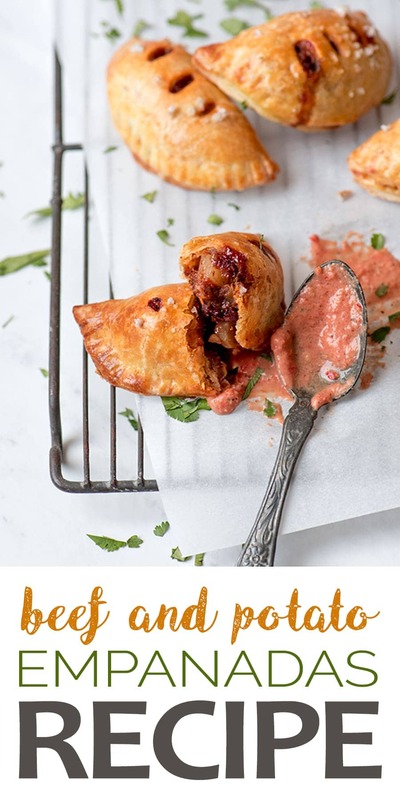 Beef and potato empanadas are the perfect two bite-sized snack! 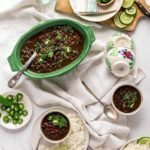 They are made from scratch with flavorful Latin-American spices and served with a tomato chipotle sauce for dipping. I absolutely love empanadas! But really, who doesn’t like a hand pie? Kevin and I like to make them for parties because they are so easy to prep in advance, freeze, then bake from frozen. One of the best tips I can give you about party appetizers (and party food in general) is always do your major food prep in advance. There’s nothing as awful as having your kitchen a mess when the guests show up. Ever notice how everyone ends up in the kitchen? For this reason, I’ve made lots of flavors of empanadas over the years. But these beef and potato empanadas might be my fave! 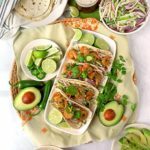 They are stuffed with tons of ingredients to make them extra tasty. Things like green peppers, olives, raisins, and of course spices! Now, I won’t lie to you. Making empanadas from scratch is a labor of love. Cooking the filling and preparing the dough is the easy part. But rolling, filling and shaping part of empanadas is messy and takes time. So, I’d definitely say this is a recipe for someone who loves to be in the kitchen. Personally, I like to break up the process by making the dough and filling one day and then finishing the empanadas the next day. The dough needs to be chilled anyway and I like the filling to be cold too. You don’t need much in the way of special equipment. I make my dough in the food processor, but you can also make it the old fashioned way with a pastry cutter. The other things you’ll need are a rolling pin, a large round biscuit cutter and a pastry brush. I work in small batches, rolling out a piece of dough then cutting the rounds. Then I brush the rounds with egg wash to help them seal. The reason I like my filling cold is because I like to mold it in my hand, pressing out any air while forming it into a compact, crescent shape. That way when I fold over the dough and crimp the edges, the filling doesn’t spill out as easily. So, you can see with all the flour and egg wash and molding the filling how messy this can be. So, when I make empanadas I have lots of paper towels or old dish towels nearby so I can wipe my hands off. I crimp my empanadas with a fork but if you’d like to flute the edges by hand, that works too. Just make sure they are well sealed so they don’t open while baking. Then I give them a generous egg wash on the outside so they bake up a gorgeous, crispy, golden brown. Then before I pop them in the oven, I sprinkle them with coarse salt. I tend to use fancy salts for garnishing such as the black salt I used for these watermelon margaritas. In this case, I used a Celtic grey sea salt because the large crystals don’t dissolve during baking. The last thing I do before baking is poke a few, small holes in each empanada to vent them. That way if the filling is a little juicy, the excess will come through the vents, rather than cracking open the seams. In case you’re wondering, I do the vents last so I don’t seal the holes with egg wash. Okay, doesn’t seem that hard, right? It’s not, but imagine making 60-70 of them! I make them in big batches because they freeze well, and it’s too much mess to make a small quantity. Maybe it’s just me, but I end up with flour all over me and the floor and gluey egg wash all over the countertops. That’s why I like to make one big mess so there’s lots of empanadas in the freezer for quick snacks and meals. 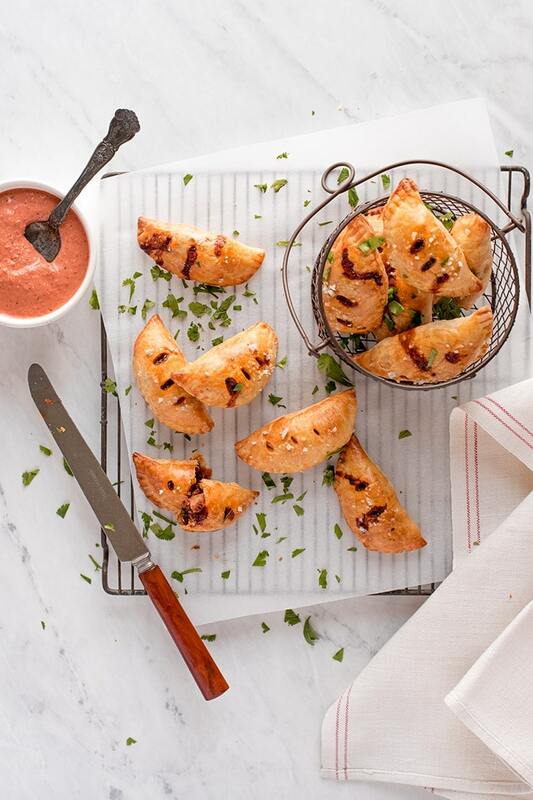 Of course, empanadas make the perfect finger-food appetizers! 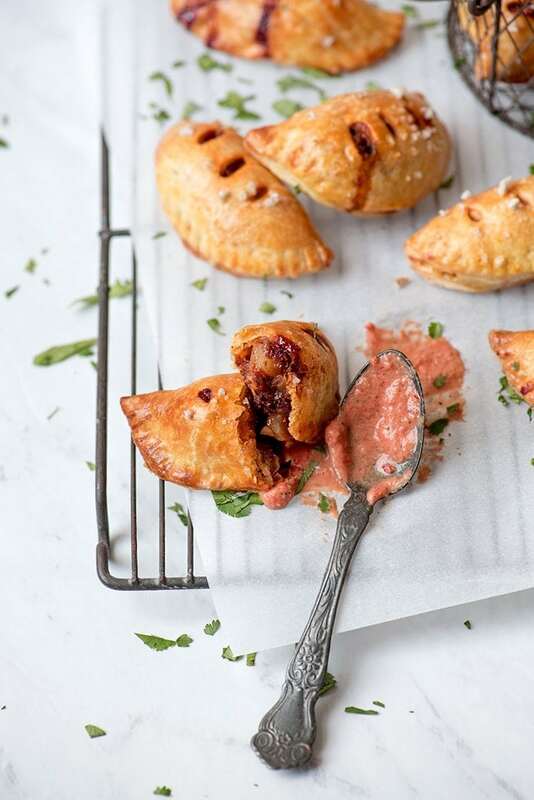 Here, we’ve paired them with a sour cream and chipotle tomato sauce, but this beef and potato empanada recipe is also great with our chimichurri. Very delicious either way. Just because they’re little doesn’t mean they have to be served as appetizers! Kevin and I also love them for lunch or dinner with a side salad or veggies. Which brings me to the size of the empanadas. I’ve always eaten (and made) small empanadas, but my friend Lissette who is Puerto Rican says they would call these empanaditas. She told me that their version of empanadas are more like the size of calzones. 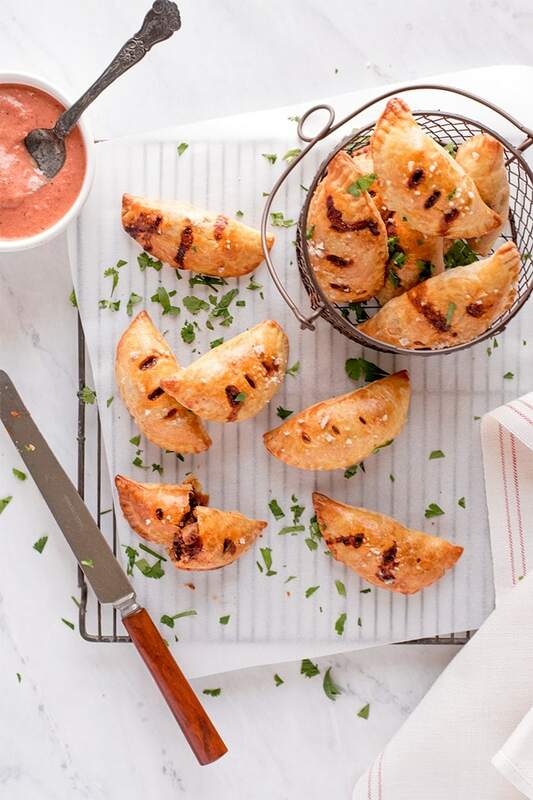 So you can make these empanadas any size you’d like! With that in mind, the number of empanadas this recipe makes will depend on how large you make them and how thickly you roll the dough, but if you make them the same size as these (3.5 inch rounds) plan on getting somewhere between 60-75. 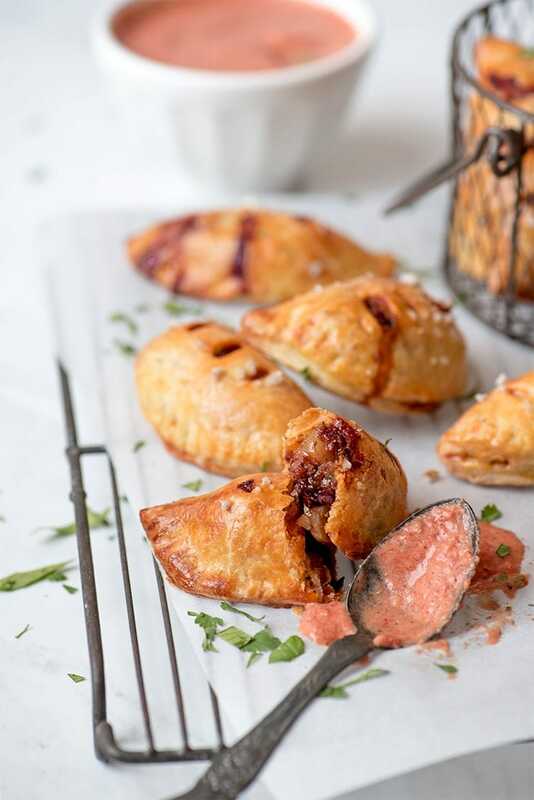 No matter what size you like your empanadas, these beef and potato meat pies will become a favorite recipe. They are rich and meaty with a great balance of flavor. There’s olives for salt, raisins for sweet, spices and garlic to make them savory and of course tomato to pull it all together. 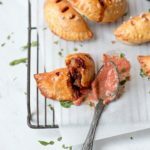 These tasty meat pies are the perfect freeze ahead appetizer! 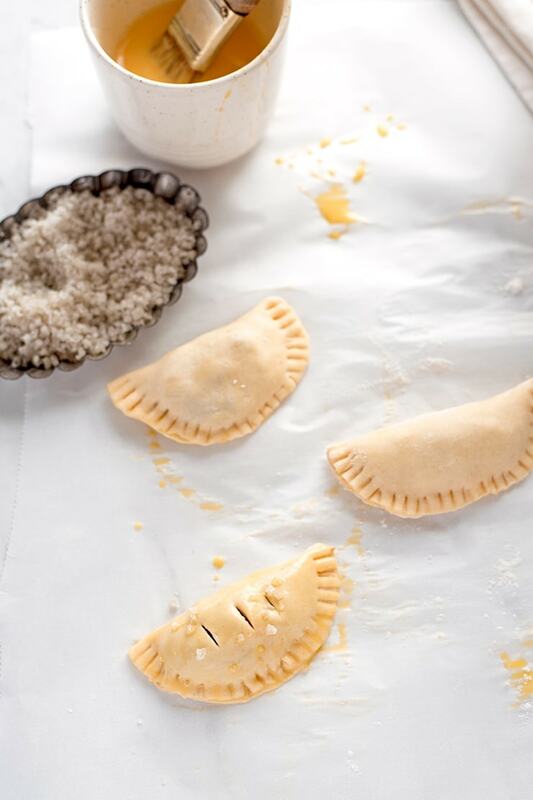 See the recipe notes on the best way to freeze these empanadas for later. Make empanada dough and refrigerate until cold. I typically make this one day before I want to fill the empanadas. In a large dutch oven, heat one tablespoon of butter over medium heat then add the ground beef. Brown beef, breaking up any chunks with a spoon. When the beef is browned, using a slotted spoon, transfer the beef to a bowl and set aside. Add the onions, garlic, pepper, spices and potatoes to the pan and turn up heat to medium high. Cook stirring often until potatoes are soft and excess liquid from the beef and veggies has cooked away. Add extra tablespoon of butter if necessary. Move the veggies to the side and add white wine to deglaze pan. Scrape at the bottom with a wooden spoon while the wine cooks away. Turn back the heat to low and stir in the olives, raisins, tomato paste and salt and mix to combine. Add the beef back to the pan, mix well and taste for seasoning level. Add salt to taste if necessary. Turn off heat and let filling cool enough to handle. 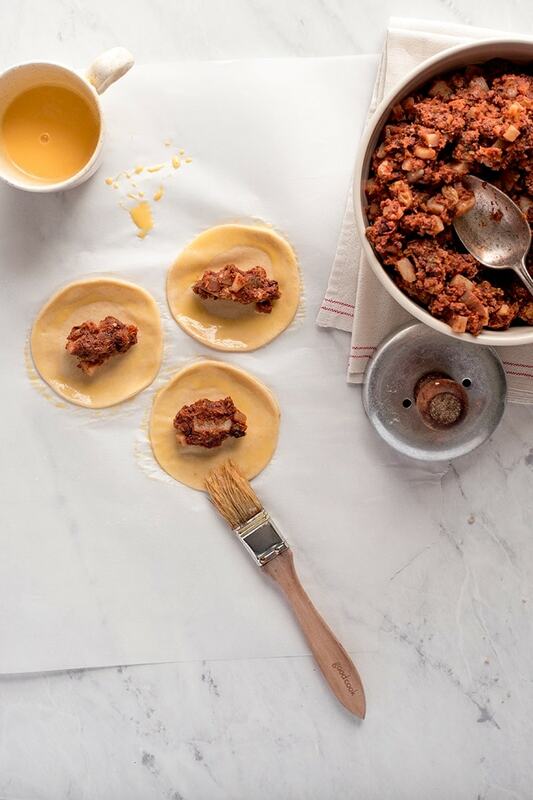 Like the dough, you can do this in advance and refrigerate the filling for 1-2 days before shaping empanadas. 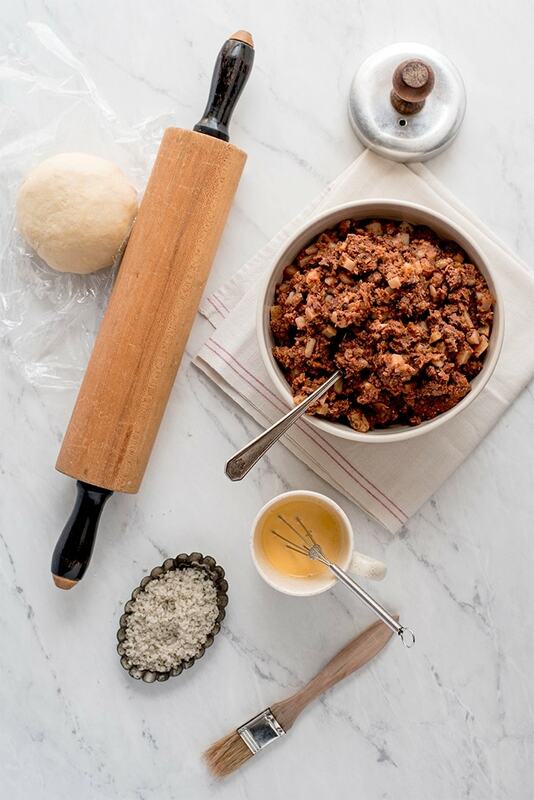 Cut your empanada dough into 4-6 sections. Cover and refrigerate all but one section. Lightly flour your work surface and roll out dough very thinly (about 1/8-3/16th an inch). Cut dough into rounds. I used a 3.5 inch cutter, but you can make them larger if you want dinner sized empanadas. Mix together the egg and heavy cream in a small cup then brush the egg wash into the edges of the dough. Take about a tablespoon of filling and squeeze it in your hand. I find this helps mold the filling, making the empanadas easier to shape and seal. You obviously want lots of paper towels or old dish towels handy for wiping your hands. This is a messy process! Pick up the dough and hold it in the palm of your hand. With the other hand fold the dough, pinching and pulling the dough closed from center to the right and from the center to the left. 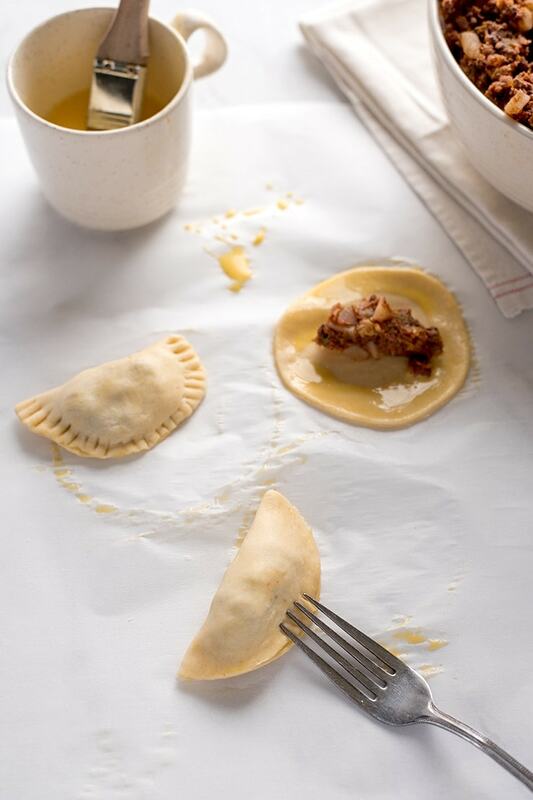 Lay the empanada back down on your work surface and crimp edges with a fork dipped in flour. Now repeat until all of your empanadas are made. At this point you can freeze the empanadas. I place them on cookie sheets, spaced enough that they won't freeze together then freeze uncovered. Once frozen I transfer them to a covered container and freeze up to three months. If not freezing, preheat oven to 400F. 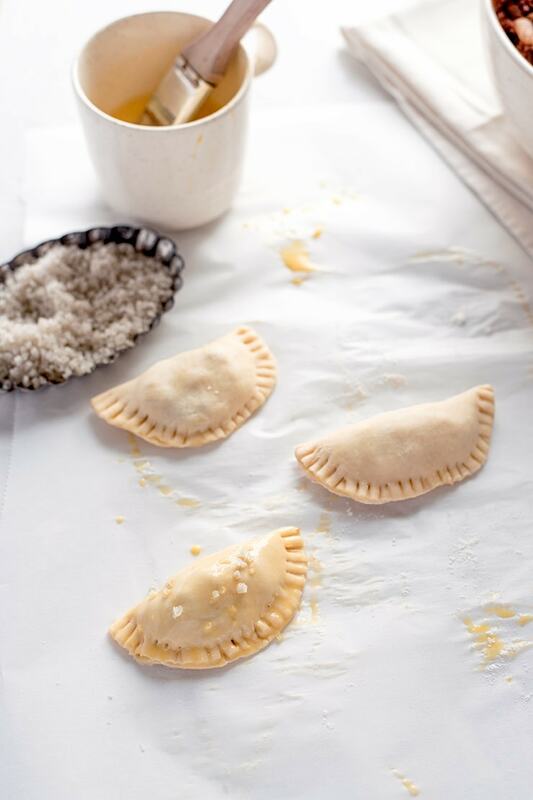 PLace empanadas on a baking tray, coat with egg wash, sprinkle with coarse salt and then poke a few holes to vent. Bake for about 20 minutes or until very golden. If your empanadas are frozen, do not thaw. Do the egg wash with salt then bake for about 10-15 minutes then pop them out of the oven and cut some vents, Return to the oven and finish baking another 15-20 minutes or until the outside is golden and the inside filling is hot. In a small skillet, heat olive oil over medium heat. Add the garlic and hot peppers, cooking until soft. Transfer to a food processor or blender with the rest of the ingredients and process until smooth. Season with salt to taste. You can chop the ingredients in a food processor to speed up the prep. You want the filling to be dry not wet. So really cook down the veggies so the water in them evaporates. It's important to vent the empanadas, otherwise any moisture bubbling in the filling might pop open the dough. Nothing is as awesome as a sweet, juicy, summer tomato! 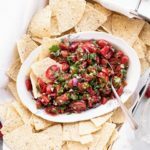 But you don’t have to wait for summer to make this fresh cherry tomato pico de gallo. Such dishes are called SAMOSAS in the Asian region. Amazing read. I think every culture has a version or either crispy pie or soft dumpling. Dough + meat (or veg) is a classic! 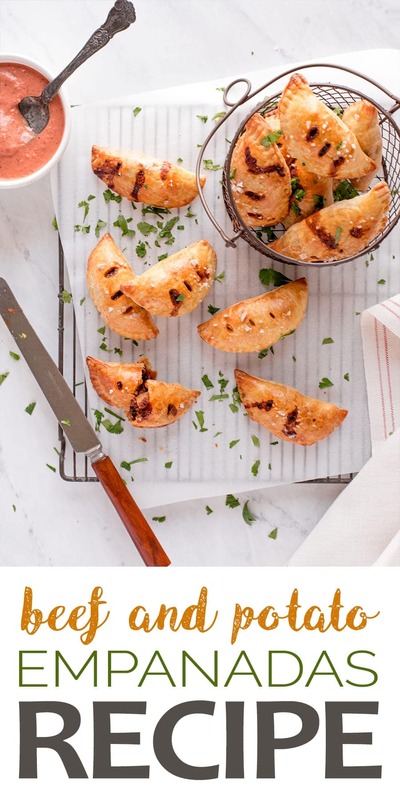 These cute little Empanadas are such a lovely and delicious party snack. Flavors to them are amazing. These look crunchy and surely yummy too. My friends and family to enjoy every bit of it. Oh they will love them Veena! I love how you break down the work over a couple of days, and your instructions are so clear, I may never buy frozen empanaditas for my parties again. Thanks. Never again! And definitely break up the work, doing it in one day would be exhausting!